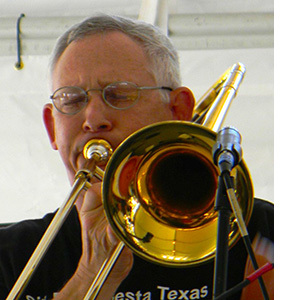 Mark Hill, trombonist, has extensive experience in both classical and jazz idioms. A professional musician for the past thirty years, he earned a Bachelor's degree in Music Education from Tennessee Technological University and a Master's degree in Music Education from the University of North Texas. He performed under the batons of illustrious composers and conductors such as Karel Husa, Elizabeth A. H. Green, and Aaron Copland. He has studied with Leon Brown, Royce Lumpkin, M. Dee Stewart, R. Winston Morris, Leon Breedon, Rich Matteson, and Jamie Aebersold. Mark served for over twenty years as a trombonist in the Air Force band program. Throughout his Air Force career, he excelled at both music and administrative duties. He led various ensembles and performed as a trombone soloist in concert bands, chamber ensembles, pop music groups, jazz bands, and jazz combos. He played on a number of Air Force recordings, including The Band of the West's recent Jazz Heritage II CD, produced by and featuring the music of Gordon Goodwin. He oversaw a variety of band functions including travel expense accounting, public relations supervision, media production, supply purchasing/management, training administration, and deployment preparation. He published the Band of Flight's first newsletter and produced the liner note booklet for two of the band's CDs. He has provided ceremonial music and entertainment for four U.S. Presidents and numerous global political leaders. As an Air Force musician he performed with a number of world-renowned jazz and classical musicians at major music festivals, seminars, and workshops. Some of the musicians he has performed with include Rob McConnell, Eric Marienthal, Alan Vizutti, Dave Steinmeyer, Nicholas Payton, Conrad Herwig, Arturo Sandoval, Peter Schickele, Harvey Pattel, Jack Stamp, Anacani, Toni Tenille, and Andy Williams. Prior to joining the Air Force Band, Mark was band director for the Chico Independent School District. Since his retirement from the Air Force in 2005, he has been teaching at West Avenue Elementary School with the Northeast I.S.D. Mark is the adjunct professor for trombone at the University of the Incarnate Word. He works as a freelance trombonist in San Antonio and the surrounding area. He has also provided volunteer assistance with the San Antonio Youth Jazz Ensemble. In San Antonio, he has performed with Six Flags Fiesta Texas, Max Class Studios, Nightfire, Al Sturchio Entertainment, Ditto and the Dots, the "Thrasher" Big Band, Small World Jazz Combo, The King William Jazz Collective, Primetime Jazz Orchestra, UIW's Cardinal Jazz Band, and the San Antonio Jazz Orchestra.